The Masters Group specializes in wedding entertainment as over 90% of our events are for wedding clients. We fully understand what it takes to successfully plan, coordinate, and perform at a wedding. 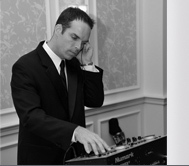 Whether you need ceremony music and sound, a separate cocktail system, or just reception entertainment, we can accommodate any size venue or crowd. We start with a personal consultation to uncover your needs and examine your unique vision for your day. Whether you're looking for a traditional reception or something more non-traditional such as a cocktail party, we have the expertise necessary to deliver exactly what YOU want. By utilizing our Online Planning Tools, we map out the details and execute that plan on the day of your event to make it well organized, smooth flowing, and stress-free. Referred by some of the finest caterers and facilities, The Masters Group is the choice of Philadelphia couples looking for that something special to make their wedding day everything that they've always wanted and more. See what other Philadelphia brides and grooms have to say about us....here.